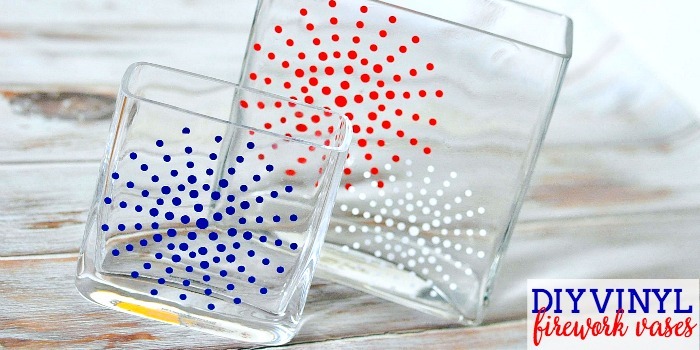 Easy and temporary DIY Vinyl Firework Vases – a festive 4th of July craft! I decided that it was finally time to do some summer decorating this week. I am a little embarrassed to admit that the picture frame in our entry way still has a spring print in it. My first summer decor project? I decorated a couple extra vases sitting around with some fireworks! Using my Silhouette, I chose design #10596. I liked the little dots. Then, I prepped the vase by cleaning it with rubbing alcohol. 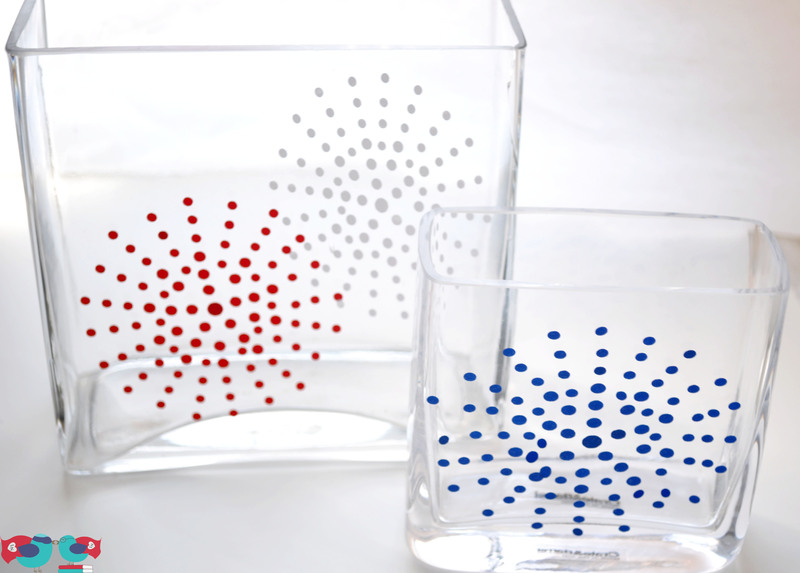 After cutting out the design on scrap pieces of vinyl in red, white and blue (of course), I used transfer paper to move the design over to the vase. 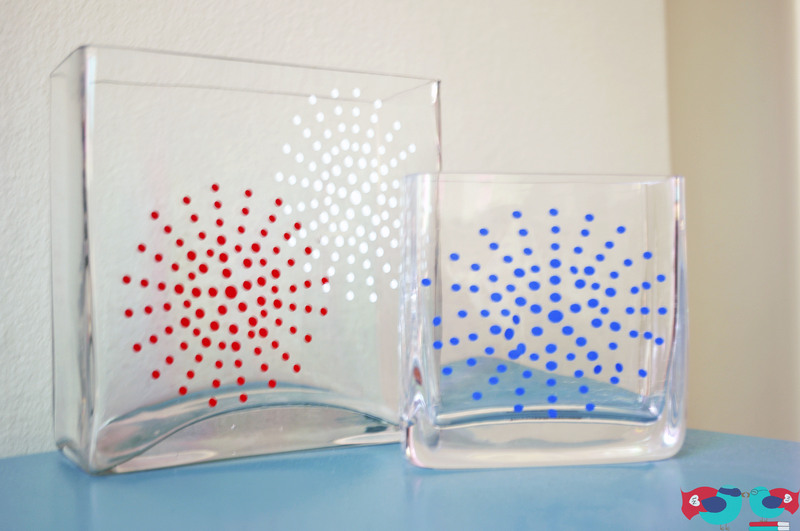 With all these little circles, make sure to rub the design well for both transfers. It is subtle, but I like the special little touch they add to the other plain vases. I also like them because I can easy take off the vinyl after the 4th of July without much expense wasted and maybe decorate for the next holiday. 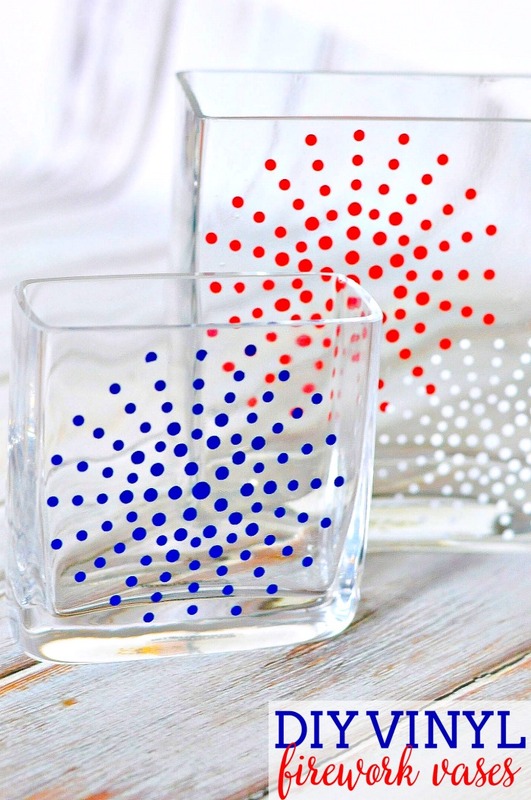 Plus, this is perfect for a 4th of July party. You could decorate a couple vases and use them as utensil holders, decorate a bowl for food presentation, or add to plastic glasses for guests. So many fun options and designs you could do. I’m featuring you tonight in my Project INspired Features Post! Hope you can swing by for a look and share more of your creativity too! 8 pm EST the party starts again at: http://www.settingforfour.com/ Pinned too! This is really cute! I don’t have a Sillouette, but if I did, I’d be making these right away! Thanks, Kristen! Heather below is thinking about doing it with acrylic paint and a pencil eraser. It is such an easy pattern to use that technique. Very cute! I love that you can take it off for the next season/holiday, etc. Great idea. Thanks, KC! And thanks for stopping by. Thanks, Heather! This would be such an easy pattern to do with paint. If you decide to do it, I would love to see the finish product. These are really, really, REALLY great. Pinning! Thanks, Adelina! I can’t remember where I got the bigger vase, but the smaller one was a free gift when we registered at Crate and Barrel for our wedding.